Home / Stories / Visit the new Velleman for Makers webshop! Visit the new Velleman for Makers webshop! Velleman for Makers provides the maker community with DIY electronics and equipment to bring ideas to life! Join our quest to learn about electronics, 3D printing, programming, mechanics and more useful skills! Aside from illustrated manuals, we also post tutorials and projects on the manual platform. Yet, finding all ingredients for these projects proved to be difficult at times, but no more! 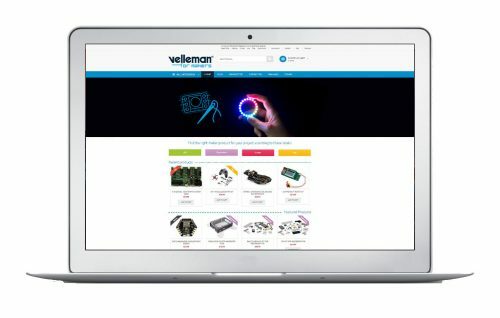 The new Velleman for Makers website brings an end to the era of searching for components, kits, modules, sensors, and more! Check out the new and improved website with a user-friendly webshop; www.vellemanformakers.com! To make things easy for new makers, we created four labels that explain what kind of project you’re dealing with; play, use, experiment and create. Find out what it’s about here! And that’s not all! The new website also has a stories section where we’ll post new tutorials, stories about the Velleman crew, news updates about upcoming events and fairs, and lots more! Treat yo self with a new maker project and let’s make things!